The average Precipitation across the United States in 2016 was 31.70 inches, 1.76 inches above the 20th-century average. Since 1895, precipitation across the US has increased at an average rate of 0.16 inch per decade, which has led to the increased danger of floods. No big deal, you may say, as most people don’t believe that a flood will ever affect them. It’s an event that they watch on the news. Why should you check your flood zone? Even if it’s statistically unlikely that you’ll be the victim of a flood similar to what happened in Houston, you definitely do not want to ignore the possibility, even in Connecticut, as one storm could wipe out all your possessions and properties in a matter of minutes. 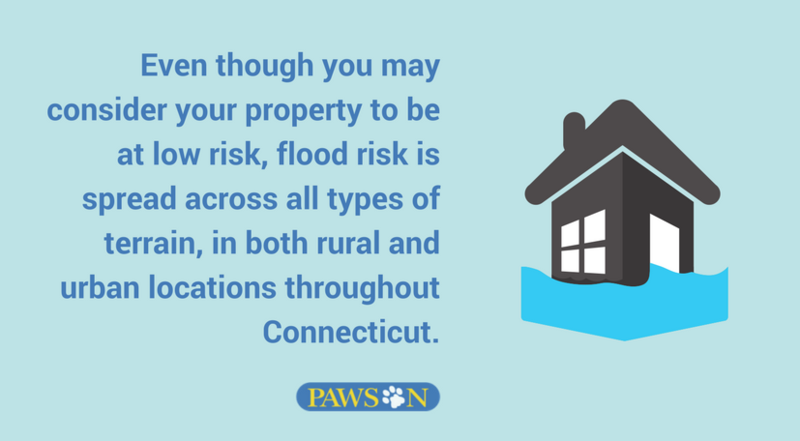 In fact, even though you may consider your property to be at low risk, flood risk is spread across all types of terrain, in both rural and urban locations throughout Connecticut. Insurers are now finding themselves paying more for sewage backups, given that the infrastructure in many municipalities can be overwhelmed by torrential downpours. If flood insurance is available to you, you may want to consider it if you are endangered or feel vulnerable. The first step is to determine if you live in a flood zone. Luckily, there’s a quick and FREE way to find out if your property is located in a flood zone. The United States Government provides flood maps online for homeowners to review. Flood maps indicate which areas generally flood if water rises to a certain level. They allow both homeowners and policymakers to make informed decisions about asset management, urban planning, and flood risk management. Find Out If Your Home Is In A Flood Zone In 2 Minutes Or Less! 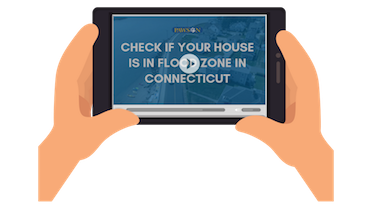 Get step-by-step instructions to find out if your house is in a flood zone In Connecticut. 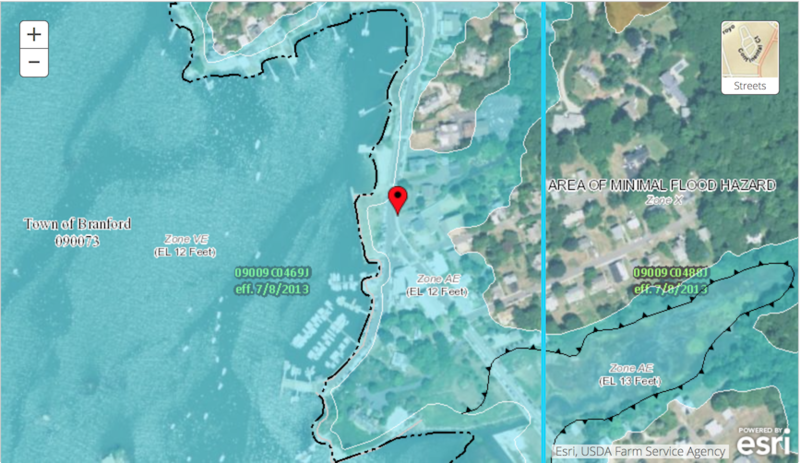 To get started, search for your property’s address on FEMA.gov and you’ll receive access to the nearest, most relevant flood map in the area, which can be exported through a PDF. There’s also another great website that I personally like a lot more because of its user-friendliness, called FloodTools.com. Floodtools.com will show you a similar kind of map but in real-time with a red outline of where the current flood zones are. There are other indications on the menu that appears on the right that will provide you with additional information. For example, the YOUR FLOOD RISK bar indicates the severity of the flood zone, without you having to look up what each flood zone means. You can also check the number of flood losses in this area, flood claims, average claim, and even active flood insurance policies all within the past 10 years. What if I’m in a Flood Zone?! If you’ve found out that your property is within the boundaries of a flood zone, the first step is to contact a qualified agent below and verify whether your assumptions are correct. They should be able to confirm or deny whether this is an issue and if so – how much it will cost you to insure over it. In need of flood insurance? See how our agency saves Connecticut residents more. We consistently beat the biggest flood insurance companies' prices! Check our flood insurance prices! We reduce flood insurance premiums for residents in Connecticut. Let's get started! Join the thousands of other Connecticut residents who have chosen to purchase flood insurance with us. Let's get started!